Still in the Royal Cape Town marina and it's been a busy couple of weeks trying to get as much as possible done on the boat. The weather has been tremendous for working outside; it's the best spell of fine weather we've had for years. Virtually every day we wake up to blue skies and it stays sunny and hot all day, but it cools down at night so it's easy to sleep. At this time of year with the sun in the south, it stays light until 8 o'clock in the evening, so the days are long and we end up working late without realising it. So far the weather here tops both Australia and New Zealand, but it could just be that we've picked a good year, which we definitely didn't in the other two. The downside is the wind - at the drop of a hat it can go from being calm to blowing 30-40kts. Generally not a problem when working on the boat, except everything has to be tied down or it's gone in a matter of seconds. And that includes the boat! We have quadruple lines on the bow and stern, and double lines for springs. The two major jobs are replacing the rigging and replacing the sprayhood and bimini. The rigging is virtually complete, with all shrouds now in place. We're using dyform throughout (apart from the running check stays) as it's supposed to be 30% stronger (and, or course, is 30% more expensive!). If we had a strength issue with the previous rigging, then the extra strength will help. If it was more of a fatigue issue, then it might not, but whatever, hopefully it will last a good while (that is if we don't cross the Indian Ocean every other day!). The one rigging job still to do is to replace the sheaves at the top of the mast which the main halyard and topping lift use (one is no longer round!) 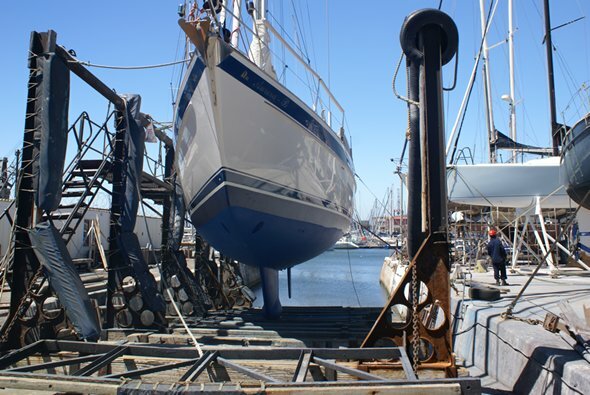 To do this seemingly simple task, the top of the mast has to come off. Not easy when the mast is still up. But the rigging guys here reckon they stand a chance of doing it, so fingers crossed. The sprayhood and bimini have been trial fitted a couple of times and it's getting closer. In Australia we created a prototype combination where we actually join the sprayhood and bimini together with a clear panel so we stop rain, and waves going up over the sprayhood and into the cockpit. It worked well on the passages from Australia and saved the cockpit (and us in it!) from several drenchings (or early baths, as one BBC commentator used to say). The prototype was joined by lashings and these are being replaced with proper zips, making it much easier to use and it should look much less of a Heath Robinson construction. At least we hope it will. Other things have included fixing the VHF cockpit repeater, requiring several solder joints. Soldering is not one of my top skills and despite following all the tips in the books and on U-Tube, the solder still refuses to go where it's supposed to! However, I did it. The internal working doesn't look pretty, but that's hidden and it does now work. The windlass has been a more significant issue. It's been playing up - sometimes it works and sometimes it doesn't. Up until now, when it didn't, repeatedly hitting the switch or turning the drum by the emergency handle would get it going again, but this weekend it seemingly died completely. We have 90 metres of chain - that's a hell of a lot to pull up by hand, so getting it fixed is critical. The conclusion of engineers here is that it's electrical and the simple thing to change was the control box. That didn't solve it and the motor is now believed to be the culprit and has been taken out and is with a repair shop in Cape Town. From what they've seen they are sure that's the problem and are going to refurbish it. So fingers crossed on that one too. We had thought of getting a new windlass as we're so dependent on it, but they're very expensive and they can't get one here for at least 6 weeks. We can't wait that long. Another big job was taking the boat out of the water on the slip they have here. They have a crane, but we're too heavy for that. The slip is good as it makes it easier to antifoul with no boat props in the way, but there's always a queue to use it so time on it is very limited. We were out and back in within 4 days. Not strictly true as we went back on the 5th day, but that was only because it was too windy to re-launch us. We spent all of the morning on the day we were due to go back in the water waiting for a lull, but it never came and the boat yard crew gave up shortly after lunch. If it's too windy the slip cradle gets blown off its railway tracks once the weight of the boat comes off it, so not a good idea! We did manage to do most of what we wanted - antifoul, check and grease the feathering propeller and rudder bearing, and change all the anodes. Well not all the antifouling. 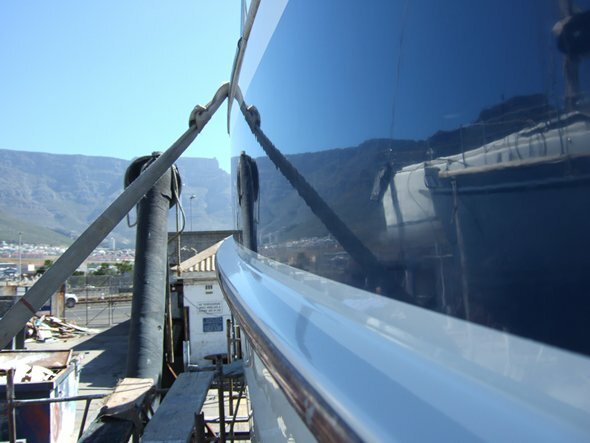 As said before, we have 3 different types of antifouling - 2 lines of hard antifouling along the waterline (so we can scrub it if we have to) and the rest self eroding, so soft. For the latter we use Micron 66 which they don't have in South Africa and if we use what they do have we would have to put a barrier coat over it if we ever wanted to go back to Micron 66. That didn't appeal, so apart from a gentle wipe to get rid of the scum on it (there were no barnacles at all) we've left it and hope it will last until we reach somewhere where they do have Micron 66. 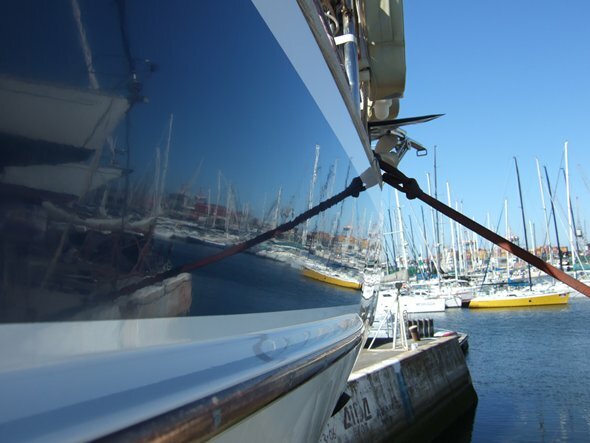 The time consuming part of the antifouling is masking up for the lines round the waterline and that's all done, so antifouling the bottom should be straightforward and quite quick (relatively speaking!). However, we have managed to get away from the boat a few times. 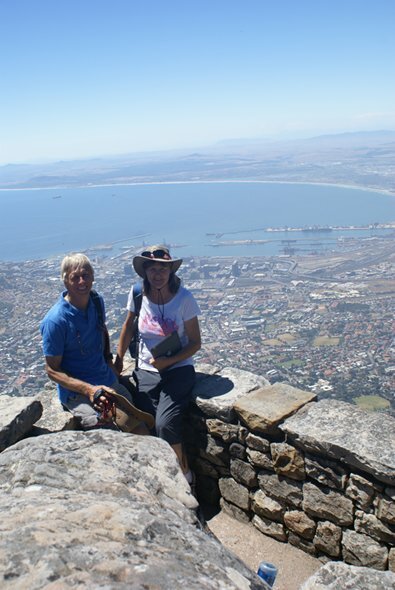 On a beautiful day with not a breath of wind, we made it to the top of Table Mountain. Remarkably there was no wind at all up there either and with not a cloud in the sky you could see for miles. 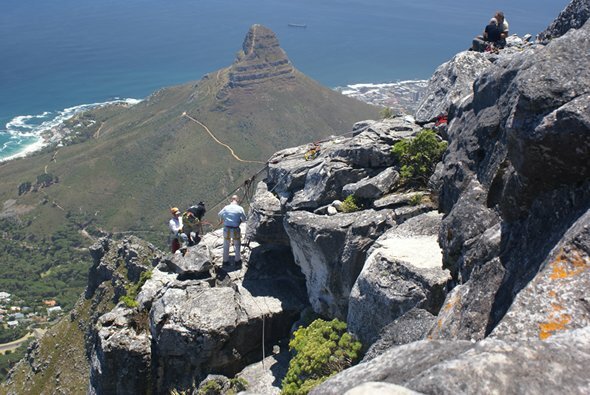 Going up on the cable car was quite an experience too. It's not something that we do that often and this one holds 60 odd people and the floor revolves 360 degrees as you go up, so every one gets a 360 degree view. It does mean that you can't hold on which is a little disconcerting to start with, but with no wind it wasn't a problem. 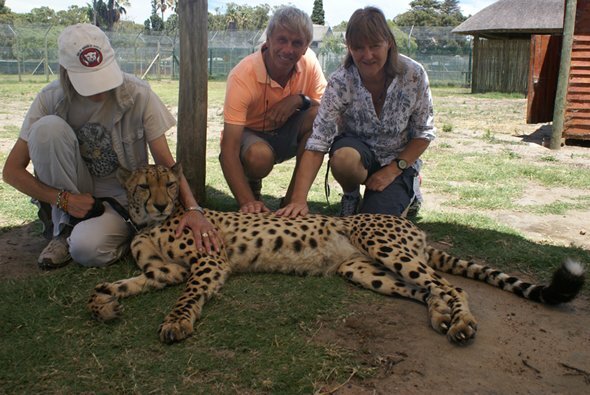 We also got the opportunity to drive round False Bay and visit places en route, including a Cheetah sanctuary where we got to learn all about how endangered they are, and to get close up and stroke one. They are wonderful creatures and purr like domestic cats, but are a bit big to have curled up on the rug in front of the fire! 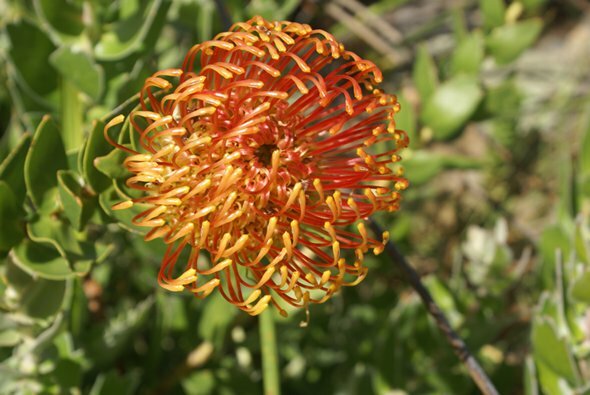 The Kirstenbosch botanical gardens in Cape Town was also on the list and it was another lovely day. 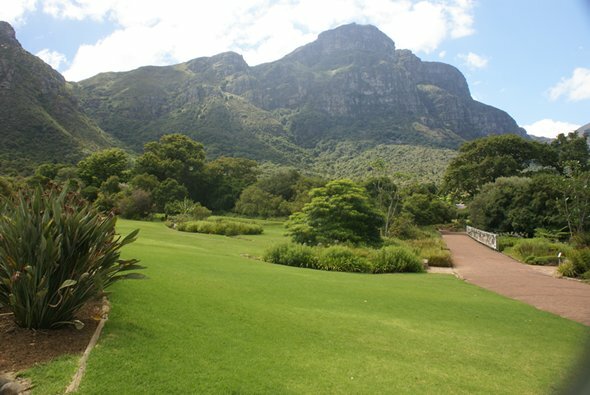 The Gardens are right up against Table Mountain and are one of the best in the world. 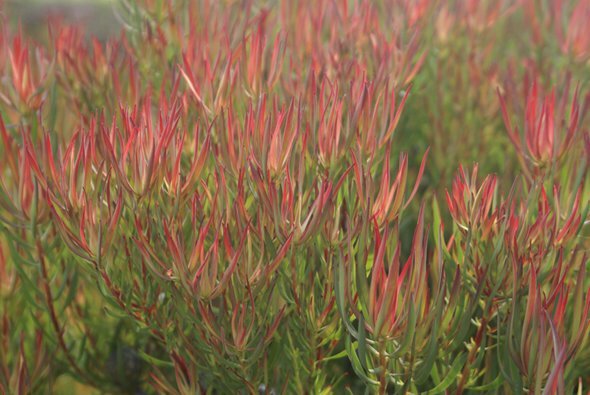 Unfortunately it wasn't the time of year for the Proteas to be out, but it was a very beautiful, interesting and tranquil place. As with most things here, it would be good to have longer. 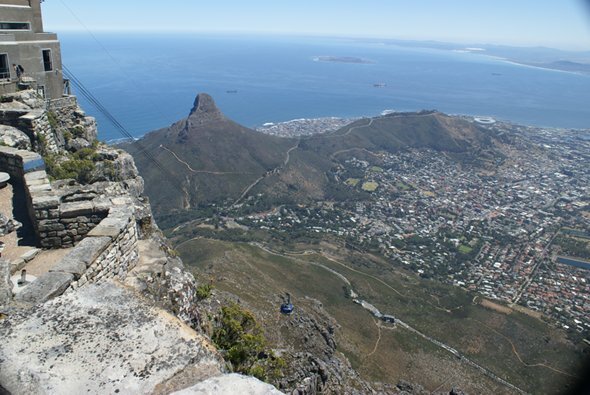 Staying more than your allotted time in South Africa is not easy with all the bureaucracy you have to go through, so very few people attempt it. One of the problems here is that different officials interpret the rules differently and what one says one day, another will disagree with the next. Most of the people we know have now left and are on their way north, but a couple are still making their way from Richard's Bay, so we might meet up with them in a couple of weeks or so. We shall see. 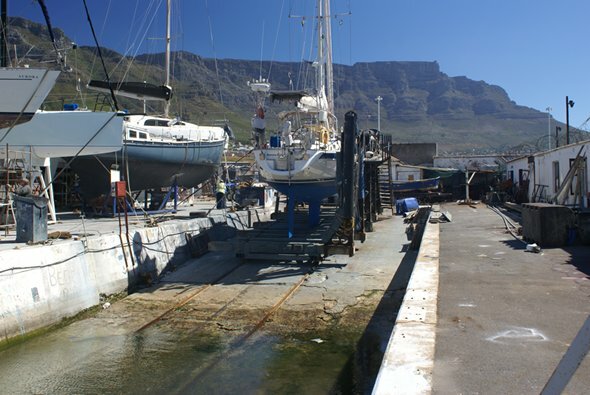 Aurora B out of the water on the slipway with Table Mountain behind. 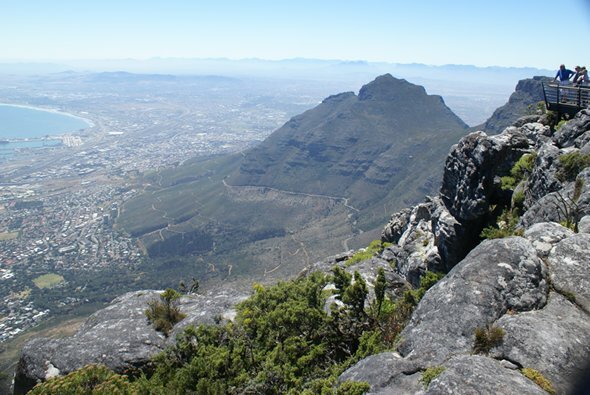 As can be seen, there is nothing of any size between the Mountain and the marina, so nothing to stop the wind which roars down whenever the 'table cloth' (cloud) forms on the top. 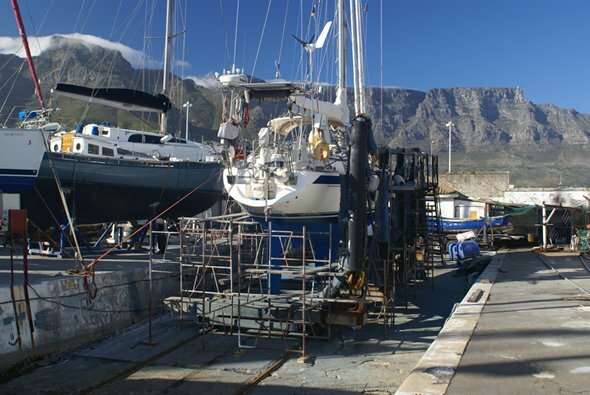 As labour is not too expensive, we arranged for the boatyard staff to put the scaffolding up and clean the topsides. We then did the easy bit of applying a coat of wax. It's nice to see her shine once again! the right decision and it lasts until we find somewhere that stocks Micron 66. 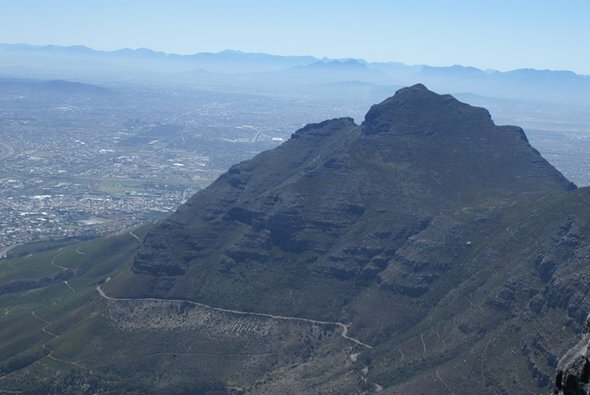 A cloudless day over Table Mountain (so no wind!). or just do it by hand. Truly magnificent creatures. With only 7,500 left in Africa, time is running out for them. The fur is actually quite coarse. One of the main causes of cheetah deaths is being shot, trapped or poisoned by farmers wanting to protect their livestock. 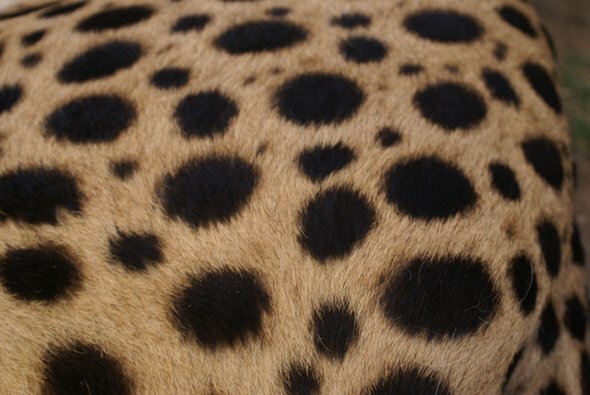 Most of the livestock deaths are not due to cheetahs, but they get the blame for it and suffer. 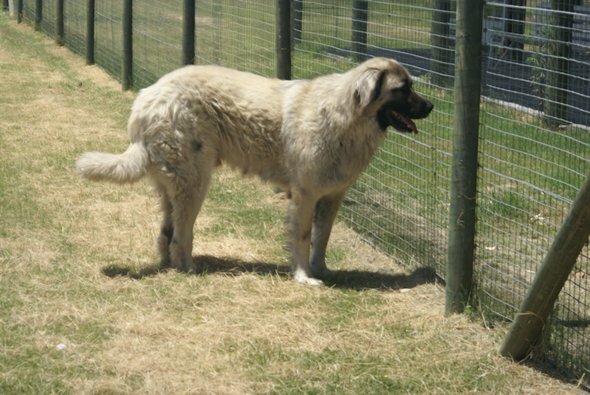 These are the Turkish Anatolian Shepherd dogs that instinctively protect the herd they are brought up with. 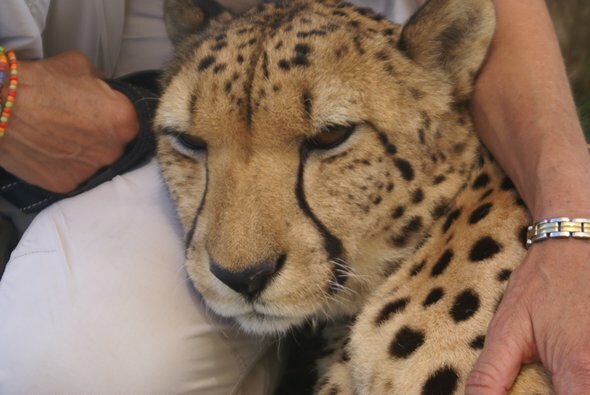 So the cheetah centre breeds them and when they're 6 to 8 weeks old they are given to farmers to raise with the herd they want to protect. One of conditions the farmers have to agree to when taking a dog is that they won't put traps and poison down. The dogs are bigger than Alsatians and considerably bulkier - you would not want to upset one! 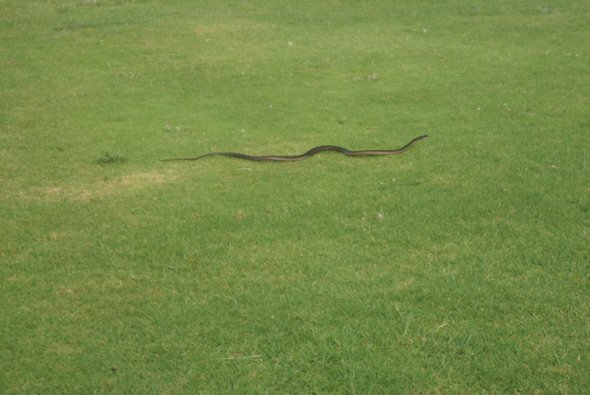 Apparently they don't make good pets as they're so protective they wouldn't let anyone near you - friend or foe! 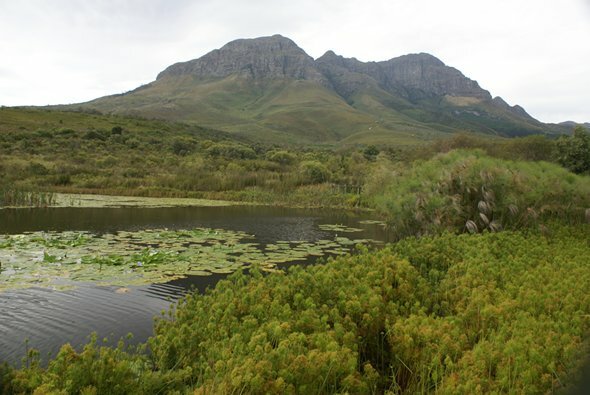 The Helderberg Nature Reserve on the southern slopes of the Helderberg Mountains. 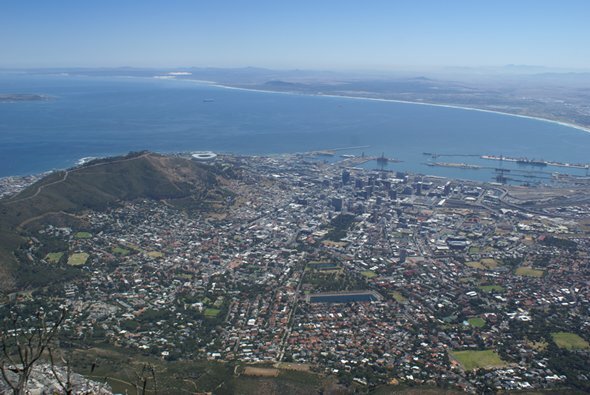 It's to the north east of False Bay, and as far as we drove to the east. 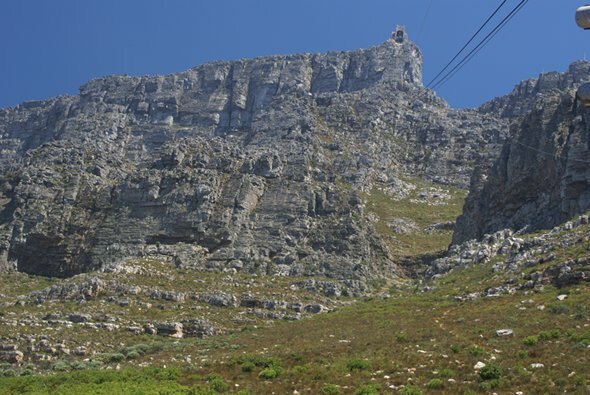 The cable car ride up the face of Table Mountain to the building right at the top. Island where Nelson Mandela was imprisoned. someone to take this. And of course we reciprocated! 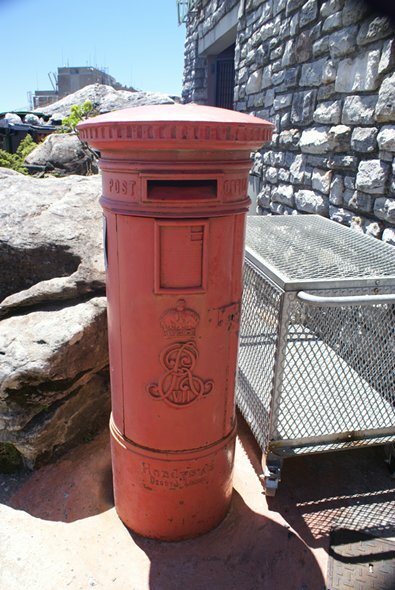 its way to the UK. left was built for the 2010 World Cup. energetic it's possible to walk up. Needless to say we took the cable car both ways! highest I want to trust my life to a rope! 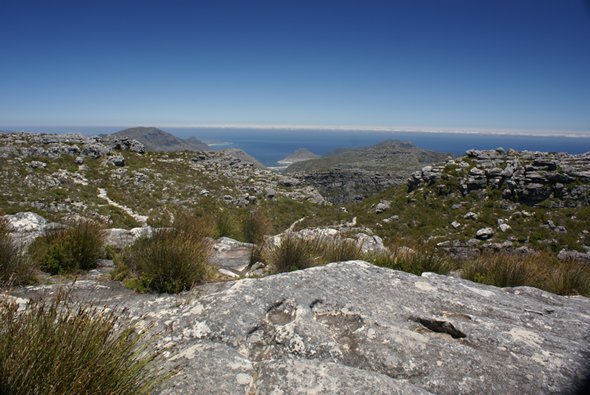 The plateau on the top, looking out across the sea to the south west. 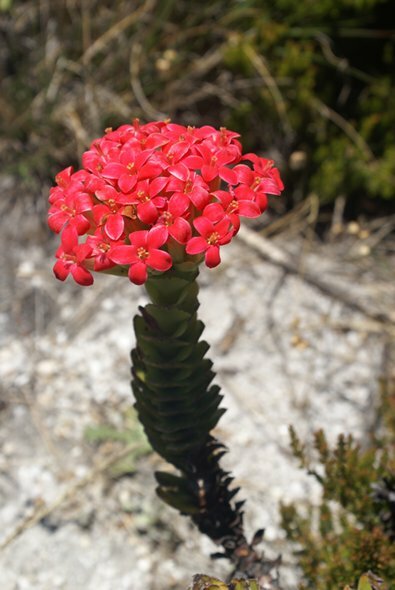 A close-up of Devil's Peak. 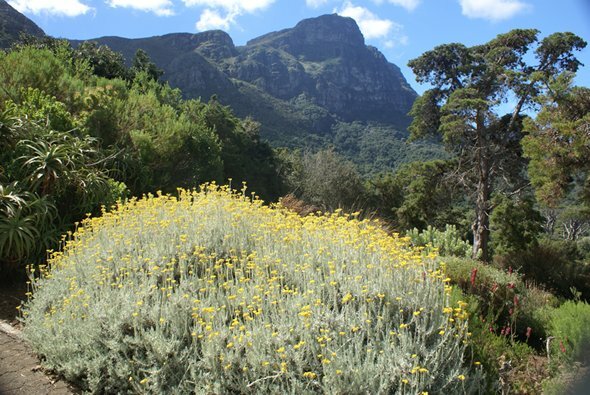 And now on the other side of Table Mountain, in Kirstenbosch Botanical Gardens. 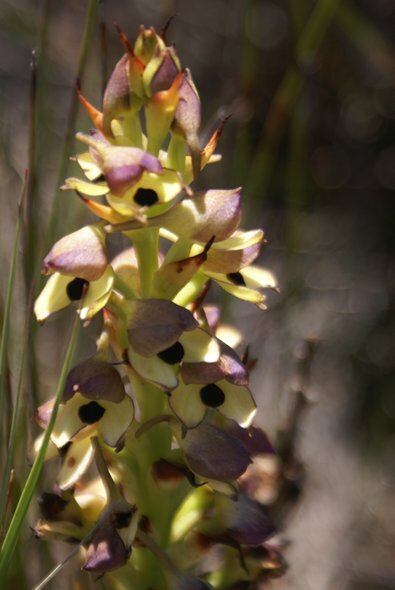 the closest we came to seeing one in flower. The gardens were just a beautiful and tranquil place to spend a summer afternoon. is venomous. So just as well we didn't get too close! 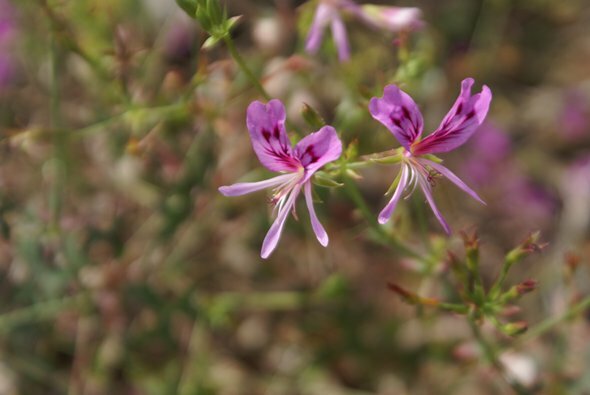 A pelargonium - a native of South Africa. 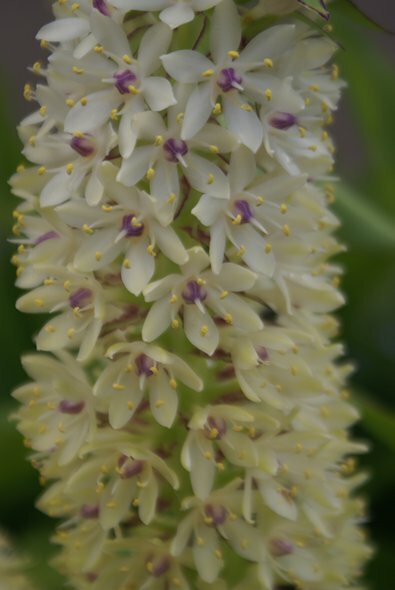 Quite stunning - still trying to find out what this is!